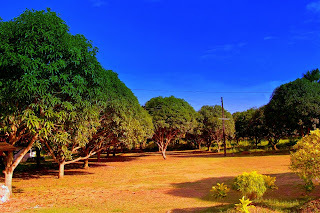 How about under the mango trees for a garden wedding venue? For the Catholics, any place outside the Church are only for the wedding receptions. For the non-Catholics, any venue is as good as anywhere else. Even under the mango trees. I'm not really kidding. If some people wed in a skydiving or scuba diving trips, why can't two people say their vows under the mango trees? Seriously though, some worms might fall on your plate. The picture above is located in Victoria Park, Liloan. They're renting out the place for a wedding venue, for receptions, or for any party or activity. The rent is P4,500 including lights and sounds. If you want to check the place, go to Liloan. There's a road to the right after San Roque Development Center. The garden is located in front of La Playa Subdivision. It's difficult to miss the sign board. So, just imagine the blue afternoon skies for your wedding, and the twilight hues during your reception under the mango trees. i've been to this place and it's really nice. do u get to have a privacy and is it guaranteed that there will be no party crashers!? coz a family of mine got married in some province..farm like kinda place.. they had to get some guards and put fences around the area for the party crashers..